Over the years, we’ve worked with many architects and planners to help them select the best transition strips for their projects. Of course, every project is different and requires its own solution. We’ve noticed that installations in schools, colleges, and other educational facilities have a unique set of requirements because of their high-traffic and sensitive communities. 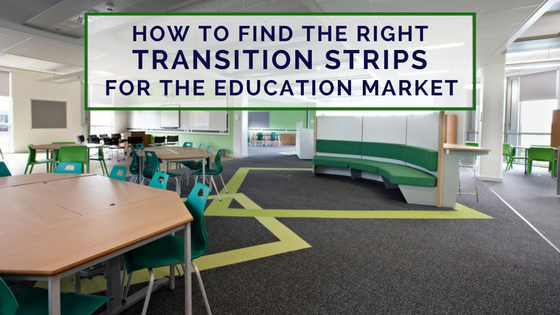 Here are our tips for finding the best transition strips for your educational installation, based on our experience with architects and planners. Transition strips can be made of many different materials, including PVC, aluminum, stainless steel, or bronze, depending on the look that the customer is going for and factors like foot traffic or whether heavier equipment will roll over the area. 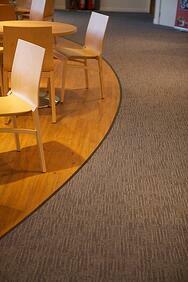 In an educational setting, there are usually many areas that join together different types of flooring. Architects are often given the challenge of finding the right transition strip for the job, even before the project has begun. When are Transition Strips Needed in Schools? Any area that joins together two different sections of flooring in a school, university or college can benefit from a transition strip. Transition strips are especially important when you need a transition from one thickness of floor covering to another. 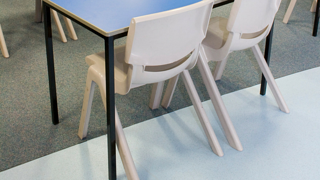 Although the transition in most educational settings is more likely to be between two similar or same thicknesses of flooring, it is possible to have an area that has carpet that transitions to concrete, or carpet that transitions to another hard surface like wood, laminate, or linoleum. If left without something to join them together, the carpet can become damaged at the edges. Also, because of the different levels of flooring, a trip hazard is formed. 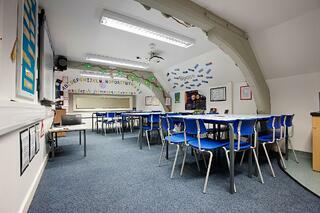 Today, we’ve seen that more and more schools are choosing to use ceramic flooring, which can be very expensive. When this is the case, you definitely want to use transition strips to protect the edges of ceramic so that they aren’t chipped and broken. The price range of transition strips can vary widely - from under $1.00 per foot to over $25.00 per foot. There are many variables that affect the cost of transition strips. The factor that has the most impact on pricing is the material used. Even though you can find very inexpensive plastic and metal transition strips in your local home improvement store, they really aren’t appropriate for an education project because of the amount of foot traffic that the product will be exposed to on a daily basis. You can find multiple suppliers for the more high-end transition strips, but we are most familiar with the Gradus line of profiles. The Gradus profiles have been used in schools, universities, and colleges across the world for many years with great success. A lot of the Gradus transition strips are composed of two pieces. The bottom is generally an aluminum base that is screwed and glued directly onto the floor surface. The top portion is then tapped into the base, forming a clean and safe transition between the two flooring surfaces. The basic Gradus PVC top and aluminum base pricing starts around $3.50 per linear foot. There are also PVC transition strips with a PVC base that can be curved on site for your radius areas. Gradus has a complete line of luxury trims that can be used in the most upscale environments, but these aren’t typically used in educational settings. Of course, if you have an atrium or focus area of the building that is their showcase area, you might want to look at a more refined and upscale profile. Although you can find transition strips that can be used outdoors, Gradus transition strips are made exclusively for indoor use. We have profiles that can help with the transitions between the same thickness of flooring (carpet, tile, wood, etc.) or between different thicknesses, as previously mentioned. Basically, if you have an area inside of a school, university, or college that requires some type of transition strip, we most likely offer a solution. Safety is paramount, especially in an educational setting. When planning a building that will be used for educational purposes, the architect must make sure that the profile is safe, dependable, and the right profile for the particular circumstance. 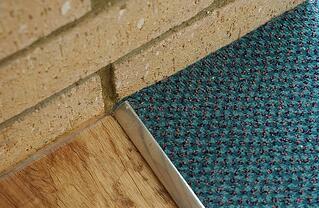 Transition strip profiles are designed for carpet in a variety of scenarios. Some combinations include carpet-to-carpet with different thicknesses, carpet-to-tile, carpet-to-wood, and carpet-to-concrete. When selecting your transition strips, the most important thing is to make sure you are choosing a profile that fits snugly and doesn’t move when you walk on it. This holds true whether you’re looking for carpet-to-tile, carpet-to-wood, carpet-to-carpet, or carpet-to-concrete/cement transition strips. You need to make sure your carpet fits snugly under the transition strip in order to protect the carpet edge from raveling. One thing to decide when choosing a transition strip for wood laminate is whether you want to use a transition strip that is similar to the wood finish on the floor, or use a metal or PVC option. Gradus has options for you no matter which look you want to achieve. In today’s architectural and planning community, there seems to be a lack of companies that can supply high quality metal transition strips to the market. 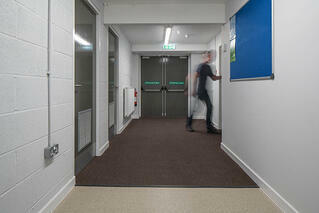 Fortunately, Gradus has several metal transition strips that are available in a timely manner. We carry both one-piece metal transition trims, as well as two-part metal transition strips that are composed of a base that is secured to the floor and a top that is tapped into the base. 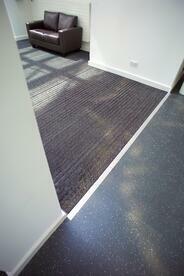 There are also heavy duty metal transition strips that have a PVC slip resistant strip. This type of transition strip isn’t widely available, but can be just what you need in an area that has extremely high traffic or can be used to transport equipment or rollers. If you need a transition strip in the cafeteria or food prep area of a school, university or college, you will certainly want to take a look at these types of transition strips.